Have you got a sports day coming up soon and need wooden spoon trophies? Look no further, we can supply sports clubs, nurseries and schools with wooden spoon awards. Wooden spoon races can be one of the most looked forward to events of the sports day, so why not dedicate a completely unique trophy to the race rather than opting for a 1st, 2nd , 3rd place trophies or winners award. Your egg and spoon racers will be even hungrier to win the race – eggscellent! Aford Awards is a trophy and engraving specialist based in the heart of Kent. With nearly 40 years of experience in producing and supplying quality trophies, we have been able to develop a strong reputation and relationship with our customers as one of the UK’s leading trophy suppliers. Our unparalled level of customer service, unbeatable prices and quality products have enabled us secure a reputation as a valuable awards supplier. Because of this, we have worked with the likes of the British Grand Prix, BBC, SRO Motorsports Group and the British Heart Foundation. 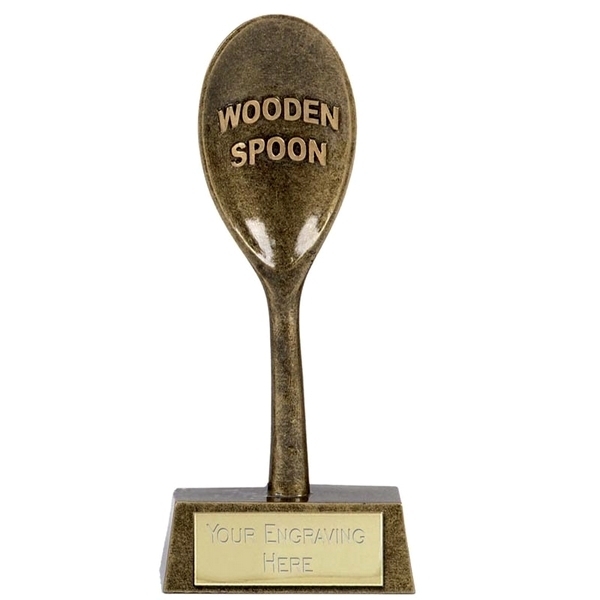 Browse our range of wooden spoon trophies above. Are you prepared for your wooden spoon race? For youngsters and adults alike, wooden spoon races can be much fun and bring out the competitive side to many racers. With most wooden spoon races held on sports day events – make sure you’re prepared for the much anticipated annual event! For most clubs and schools, the winners will be awarded with a medal or 1st, 2nd and 3rd place trophy, but why not opt for a tailored trophy specifically for the wooden spoon race? You’re bound to make your sporting event a truly special occasion with tailored trophies for each event! If you’re unable to find what you’re looking for, we also make custom-made trophies. Our bespoke service means you and our team at Aford Awards can work closely together to design and produce your very own unique trophy. Visit our bespoke trophy page for further information. Aford Award’s customers can guarantee trophies at the best possible prices. Our price promise scheme ensures that if you find an identical trophy elsewhere on the market, we won’t just beat the price, we will reduce the cost by 5%! Our price promise scheme will provide more information on how you can get the best value for money. When shopping online at Aford Awards, we offer a FREE engraving service. Our service means you can personalise all of your trophies; whether you want to add a strip of text or your club badge or logo, we use our cutting-edge facilities to make that happen. What’s more, we also offer premium engraving so that you can personalise your own belongings, including jewellery, tableware and electronics for example. We can engrave just about any surface! Please contact us if you have an item you would like personalising. If you’re interested in our wooden spoon trophies and would like one of our team members to go through the buying process with you, please give us a call. On the other hand, please explore our other categories for more general awards: trophies, cups, medals, crystal awards, corporate trophies, school medals and bespoke awards.